Full time; International Degree Programme. Dual degree programmes. The programme is designed in the framework of an intense cooperation with companies active in the off-shore sector mostly in the Ravenna region. The topics of the courses offered are specifically declined to meet both the requirements of a high-ranked engineering preparation and to answer the professional needs of the sector. 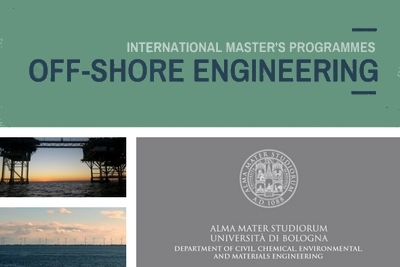 Admission to the International Master’s in Off-shore Engineering requires a 1st cycle Italian degree or equivalent bachelor achieved at legally recognised Institutions in Italy or abroad. Background knowledge is required in subjects related to off-shore engineering, as: Fluid dynamics and hydraulics; Thermodynamics; Geotechnical Engineering; Process Engineering; Structural Mechanics; Design. Knowledge of the English language (level B2 according to the Common European Framework of Reference) is also required. The two-years Master’s degree in Off-shore Engineering is entirely delivered in English. The programme aims at building knowledge to put at use in an international working environment, to cope with advanced design techniques and to tackle the improvement and optimization of off-shore operations in harsh environments. the track addressing Environmental Off-Shore Engineering, dedicated to the assessment and management of environmental and safety issues in the design and operation of off-shore structures, technologies and systems. The programme was designed in the framework of an intense cooperation with companies active in the off-shore sector. The topics of the courses are specifically defined to meet both the requirements of a high-ranked engineering preparation and to answer to the professional needs of the sector. Since its origins in 1088, Alma Mater has been student-centred hosting prominent figures from science and the arts. Based in five campuses (Bologna, Cesena, Forl�, Ravenna, Rimini), with a branch in Buenos Aires, it offers a teaching catalogue diversified and tailored to the needs of present-day society: over 200 degree programmes among its 33 Departments and 11 Schools are offered to over 81,000 students. 5,000 graduates are enrolled in PhDs and 3rd cycle programmes. The mission of the Department of Civil, Chemical, Environmental and Materials Engineering (DICAM) is to create and develop advanced research in the areas of civil, chemical, environmental and materials engineering, starting from evaluation, design, construction and service of manmade structures and infrastructures (including industrial production facilities), through the study and characterization of the constituent materials, up to the environmental analysis and impact assessment of the footprint on the territory and the environment. More than 320 people currently team up to DICAM research activities: approximately 105 academic staff, 45 technical, administrative and librarian staff and 174 Ph.D. students, research assistants and fellows. The Department is based in the two main locations of the School of Engineering and Architecture of the University of Bologna, the historical building of downtown Bologna and the new building in the strategic urban development of Via Terracini, in the close outskirt of the historical downtown, which houses the largest part of the Laboratory facilities and many modern offices for Researchers and Professors. However, staff’s activity also takes place at the Campuses of Cesena and Ravenna. The Department encompasses 11 specialized laboratories, which represent a large propulsive element to the research in all the specific disciplines, as well as an essential element for the teaching activities. The high quality, interdisciplinary nature and collaborative work of the research groups enable the Department to provide, worldwide, an effective answer to the demands of today’s modern society and of professional world. The Department faces many challenges for its future. Continuing its quest for excellence, with real impact in science and technology, is a clear goal. This goal relies on people and this is the most important asset of DICAM. Now and for the future our mission is to make the Department an ever more challenging place to be for young researchers. For all of them, our warmest thanks for the privilege of leading an enthusiastic team.